The long pending desire of Hadiya, a Kerala woman at the centre of an alleged love-jihad case, was fulfilled on Wednesday when she spoke to her husband over the phone. A day after she arrived in Salem to continue studies at the Sivaraj Homeopathy medical college as directed by the Supreme Court, she spoke to her husband using the phone of the college dean. “Hadiya spoke to Jahan (her husband) for a while from my mobile phone, after I, as local guardian, asked her whether she was interested in talking or meeting anybody, college dean G Kannan told reporters. The 25-year-old was brought to the institution amid tight security by Kerala police from Coimbatore. Earlier when reporters asked about her husband Shafin Jahan, Hadiya said she had no contact with him for the last few months as she did not have a mobile phone and the only people she spoke to were her parents. “I am very eager to speak to my husband,” said Hadiya, who was in the news recently after her conversion to Islam and marriage with the Muslim youth in Kerala. Hadiya also expressed regret for the tense situation prevailing in the college and inconvenience to students due to her, Kannan said. Stating that she has not given any application to change her name, he said she has applied on her earlier name (Hindu name-Akhila Ashokan) for internship. However, there was some confusion about where and with whom to send her during the college holidays, Kannan said adding the management will approach the apex court in this regard. All rules and regulations and restrictions of the college will apply to her also and weekly once she will be allowed to go out for buying what she requires, along with the hostel wardens, he said. Meanwhile, the college administrator Kalpana Shivaraj said the management will extend all support to Hadiya to complete her course. Hadiya’s request letter has been sent to to Dr MGR University for approval, she said. Police said one sub-inspector, four constables -- two women and two men -- will be part of her security. “For the past six months, I was talking to persons I did not like (parents) because of their harassment during my stay with them,” Hadiya told reporters earlier at the college, where she will be undergoing a 11-month internship. 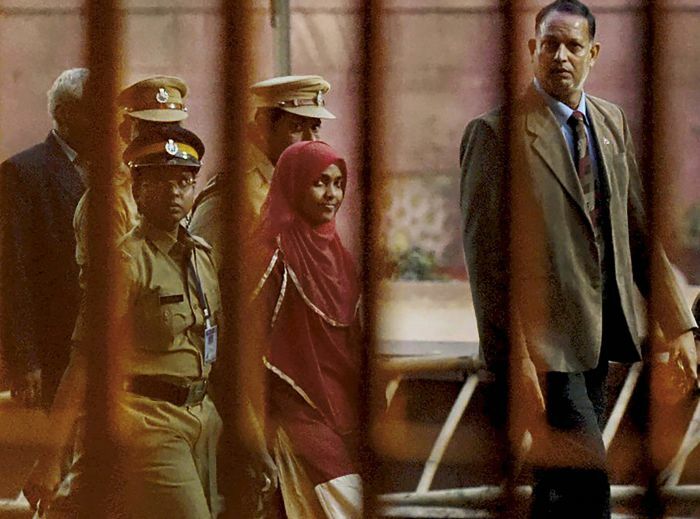 The apex court, after the proceedings, had freed Hadiya from her parents’ custody and asked her to pursue her studies. She further said she will be able to communicate better with the media persons after receiving the copy of the Supreme Court order. The court has appointed the dean of the college as Hadiya’s guardian and granted him liberty to approach it in case of any problem. She was earlier staying at her parental home in Kochi for several weeks. The court, however, did not accede to her plea to be allowed to go with her husband. Jahan had on September 20 approached the apex court seeking recall of its order directing the National Investigation Agency to investigate the controversial case of conversion and marriage of Hadiya. The Kerala high court had annulled the marriage, terming it as an instance of ‘love jihad’, following which Jahan approached the Supreme court. Hadiya's case: What if there was no Supreme Court!